Yesterday was full of adventure of the highest order. I started out by introducing Sybil to StarStream, and she was as impressed as i expected when we split orders of the Pork Conserva sandwich and the Schiacciata pizza. Afterwards, i escorted her over to Trader Joe’s where we both picked up a few grocery items. OK, that was just the background. The adventure didn’t start until i dumped the Trader Joe’s purchases at home and then whirred off to Whole Foods for some of their Comice pears and Grind-it-yourself peanut butter. I was carrying this stuff home when suddenly, with no transition at all, i woke up in a strange room surrounded by people i didn’t know. Wow! What the hell is going on? Didn’t know i’d gone to sleep. Looking around, trying to assess the situation, i noticed that my clothes had been replaced with this flimsy gown thing. Did they touch my junk? i wondered, and then remembered that once you reach seventy, your junk is safe. And then i realized that i had apparently been beaten up, as i hurt all over and everywhere i looked could see abrasions. Hmmm, i thought, hope i told ’em everything they wanted so they won’t have to do that again. Then it hit me: “This looks like a hospital,” i observed, and was applauded for my perspicuity by this young woman standing over me. “What happened?” i asked her, since the last thing i could remember was riding down 24th Street with my pears, headed home. All she could tell me was that i’d had an accident on my Segway, which had been brought with me in the ambulance and was in the hospital property room. What ambulance? i wondered. Then she identified herself as a neurologist and asked me a bunch of questions to see whether i was thinking clearly. Luckily she didn’t ask my readers, so i passed. I let her talk me into spending the night under observation since they’d taken the liberty of doing a CAT scan on me while i was unconscious (what CAT scan? i wondered) and had found some blood on my brain, which they got all excited about. While waiting in the hall on the gurney to be taken to a room, i got to witness an entertaining mini-drama. Three cops came in to talk to an injured perp in the next room, and the sight of them had a dramatic impact on this guy on the gurney just outside the door. Betraying no sense of rush, but studiously keeping his back to the cops visible through the open doorway, he retrieved his belongings from under his gurney, sat on it, and efficiently put his clothes back on. He stood, but alas, just as he was taking his first step toward the blue sky and sunlit green lawn outside the open ER entryway down the hall, three more cops came walking in. Taking this development in stride, he sat back on his gurney and lay on his side with his back to the hallway and his face in his arms. Shy, but very quick witted. I caught the eye of this other dude on a gurney across from me who’d also been enjoying the drama, and we bonded. I got wheeled away before the next act began, but i did keep listening for shouts and gunfire. I’d end this tale now except that i need to give some credits. I’ve been hospitalized twice in private hospitals and undergone several same day procedures in them, and maybe i just got lucky during my first stay at San Francisco General Hospital, but i have never had nicer nurses than the ones i encountered here. And while i’m at it, i don’t recall ever feeling a better rapport with a pack of doctors than i did the ones who saw me during their rounds the next morning. I convinced ’em that since i would refuse brain surgery even to save my life, another CAT scan would be a waste of resources, so they released me on my own recalcitrance. In private hospitals, your comfort and your recovery are purely secondary to their primary objective, which is to make sure you have no possible grounds on which to sue them. Another breakthrough on this hospital visit is that nobody knew i was in the hospital until i told ’em after i got out. A much better approach except that there was nobody to smuggle diet Dr Pepper in. Oh yes, when they brought my belongings back, i was not terribly surprised to find that my glasses and helmet were broken, and both pants and shirt ripped, but i was greatly relieved to see that i had been wearing clean underwear, and not too stylish, either. 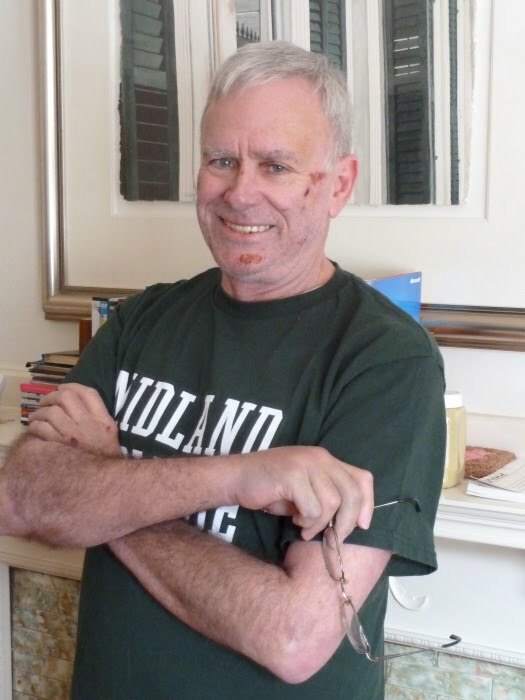 Here i am after i got home from the hospital. Update: Left the house on the afternoon of the 7th for the first time since i got home. First went to Noe Valley Cyclery and bought a new helmet since the dude agreed that i’d sure got my money’s worth outta the previous one, it having sacrificed its life to save mine. Stopped at Whole Foods to get some replacement Comice pears, and on the way home spotted what i am near 100% certain was the cause of my fall. 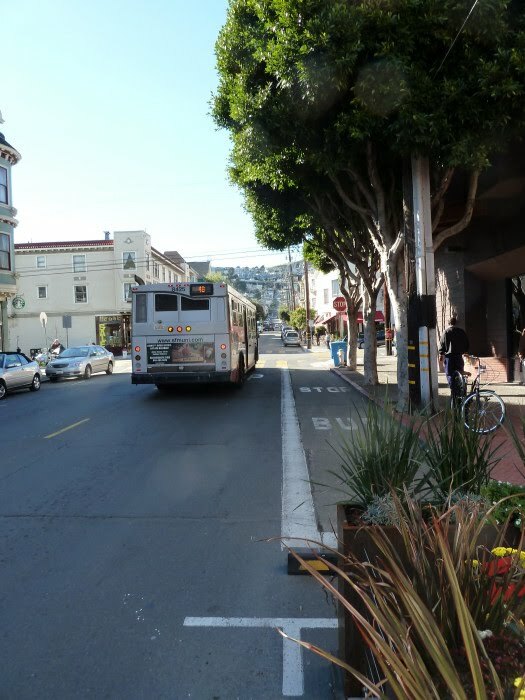 To prevent motorists from backing into and destroying the planters, tables, and chairs in our new minipark on 24th a few doors east of Noe, the city has put in low asphalt barriers about three feet on either side of the planters. Unfortunately, they extend into the street a full foot more than the planters. Bicyclists and Segwayers routinely hug the curb when possible to stay out of the way of cars, and i must have hugged a little prematurely, catching the barrier with my right wheel and doing a left side face plant, the results of which you see pictured above.